This ultra compact tripod is perfect for travelers as it is small and light weight. It can easily fi.. Flexible tripod is solidly built and durable, suitable for DSLR or Mirrorless camera body + lens and.. Flexible tripod is solidly built and durable, suitable for small compact camera and able to easily b..
Instantly turn your monopod or selfie stick into a tripod. You can also use it as a mini tripod for .. This tripod will restock in Mid AugustUnlikely many travel or compact tripods in the market which co.. 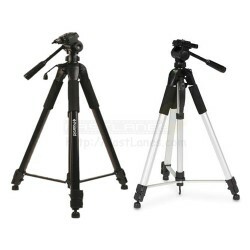 The Polaroid Tripod extends up to 72" (1.82 m), supports up to 20 lbs (9.9 kg), and weighs just 3.83.. This tripod sling strap will allow you to shoot with your tripod on the move. You can easily carry a.. Functions:Tripod + 3-Way Head Extend to 1020mm Built-in bubble level 360° horizontal an..
As we have seen many customers who want to travel with DSLR/mirrorless camera but doesn’t like the w..
A tripod can get you pictures you couldn’t capture otherwise. The Nifty Zipped makes it so easy to h..